Replying to an email message in Outlook is almost as easy as reading one. On the bottom of the message screen are three icons that look like bent arrows. The leftmost one — a single arrow pointing left — is the Reply button. Touch that one if you want to reply only to the person who sent the message to you. Touch the middle arrow — the one that looks like two bent arrows stuck together — if you want to reply to everyone to whom the message was addressed. In either case, the message reply form opens — already addressed to your intended recipients — ready for your reply. 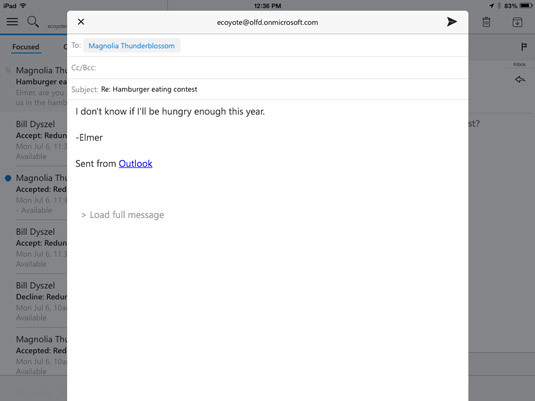 If you’re too hungry to wait to answer, Outlook mobile makes email replies quick and easy. The great thing about replying to messages on your smartphone is that you probably have dictation capabilities, such as Siri or the Android is dictation features, so you don’t need to type. The scary thing about that is the unspeakable errors that speech-to-text software can produce. Siri can come up with some real whoppers. Siri has a real potty mouth sometimes! So, if you dictate email messages that aren’t addressed to sailors and stevedores, Here’s one word of advice: Proofread!